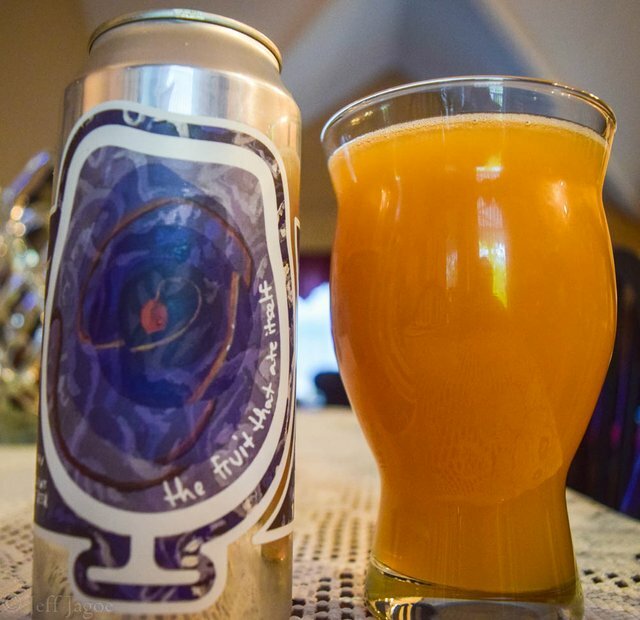 The Fruit That Ate Itself is a 7.2% alcohol/volume American IPA brewed by Foam Brewers in Burlington, Vermont. 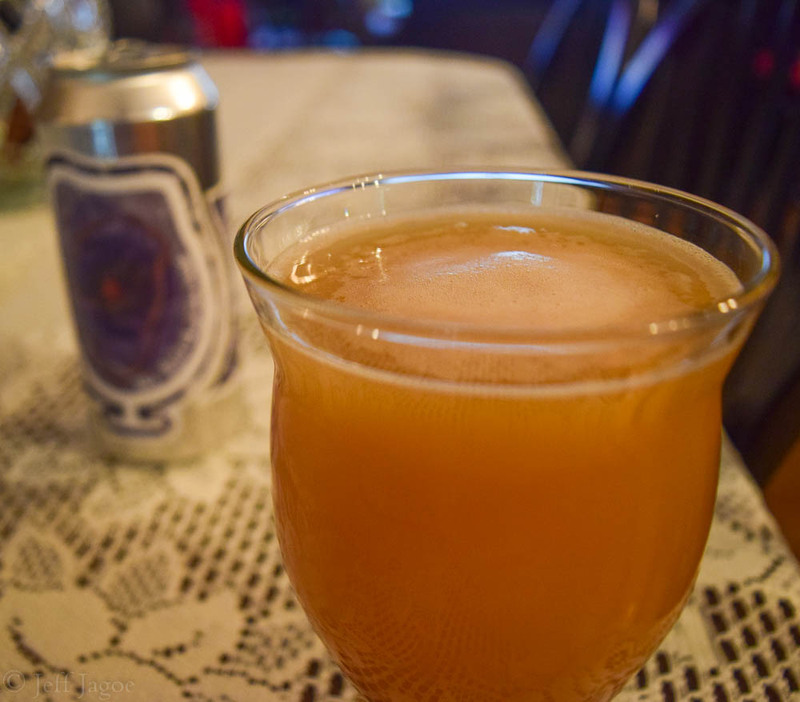 Foam Brewers is a relatively new operation that opened up in 2016 by a group of individuals with a shared passion for brewing, science, art, music, and culture. They quickly made a name for themselves in the craft beer scene. The brewery is located directly across from the beautiful Lake Champlain. They are named 'Foam Brewers' because foam is one of the most exciting parts of the beer that provides the drink with stability and complexity. The Fruit That Ate Itself was a juicy and fruity IPA. 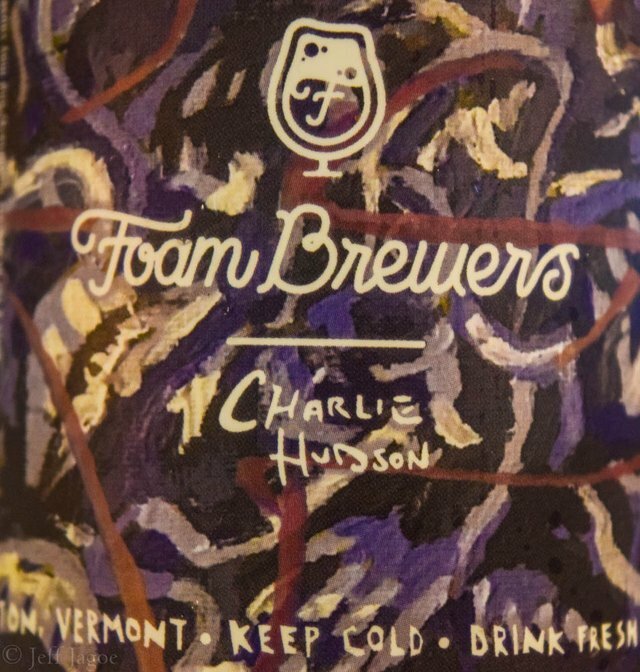 It was the first beer I ever tried from Foam Brewers and I managed to get some cans last time I went up to Vermont. The Fruit That Ate Itself is served in a full pint can. On the front of the label the typical Foam Brewers logo is featured in a purplish color. A small red apple in the center is connected by a swirling umbilical vine. It's definitely an attractive can for a delicious beer. The words 'The Fruit That Ate Itself' are inscribed up the side of the glass. The artwork for this can was done by Charlie Hudson, the man responsible for creating an art mural behind the Brewery. The Fruit That Ate Itself was an awesome name for a deliciously fruity beer. It's an unbelievably juicy beer with tropical flavors of mango, pineapple and some orange-creamsicle. The first time I went to Foam Brewers, I ordered The Fruit That Ate Itself on tap and it was a great first impression of the brewery. As you can see in the photo below, you can hardly tell the difference between this and a glass of Tropicana. Overall, it's a very well made IPA. I look forward to trying more beers from Foam Brewers in the future. the beer looks so tasty. Nice. Their beers have so much fruit flavor. That’s definitely their jam! So, are you a Vermonter as well, or just visiting? I'm a Vermont lover and Jay Peak pass holder. I stopped by Foam's anniversary celebration a couple weeks ago while I was taking my last runs of the season. Cool. The slopes and beer, our two greatest assets. Have you stopped at River Roost in White River? They are tiny, but make great beer. I haven't been there but I'll throw it on the radar! Thanks @webbie! Here in Argentina we are fans of mixed martial arts, Friday, Saturday and Sunday there is transnmission of the three categories. Cryptocurrencies increasingly gain more advertising ground, today you can see a bitcoin advertising in the least expected place.